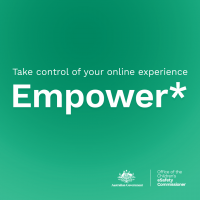 eSafety Women is designed to empower Australian women to take control of their online experiences. The website provides information for women on how to have a safer online experience. It includes helpful videos, a technology check-up, and a virtual tour of technology found in homes, cars, and personal devices. The website also benefits frontline service providers, enhancing the support they provide to women on technology safety. The eSafety Women websites enable frontline services, specialist and support staff to sign up for free, two-hour workshops on online safety. The workshops raise awareness of technology-facilitated abuse and provide staff with up-to-date skills and knowledge to support women and families.